Check out a new site about Buying Bamboo. Information to help you find quality bamboo suppliers and provides tips and advice for buying bamboo plants. A huge storm packed the foothills with snow last night. The snowfall has made for some very unique photo opportunities in the Jungle Supply Bamboo Garden. We were surprised to find some of our tall bamboo plants to be leaning over because of the weight of the snow. Although bamboo does well with strong winds from the side, the extra weight of the snow caused the plants caused the plants to lean over. This storm has reminded us of the importance of ‘winter timing’ when planting bamboo. Any bamboo planted within the last several months is vulnerable to this extreme weather. Check out some tips about cultivating bamboo here. The bamboo in the above picture is Phyllostachys bambusoides, aka Japanese Timber. It is cold hardy to temperatures as low as 5°F (-15°C), so it will easily survive this weather. 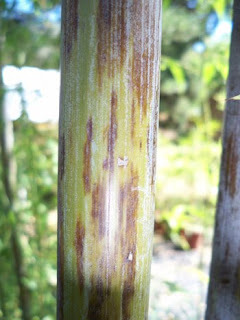 Young bamboo plants or tropical species might not be so lucky. These pictures were taken in Newcastle, California. An area that only sees snow every 5 years or so, but rarely to this magnitude. We send out best wishes to everyone in the area who has been affected by the snow storms. My girlfriend and I attended Phish Festival 8 in late October, and we had a blast. The event was held at the Empire Polo Club in Indio, CA. It was a 3 day event and Phish played a total of 8 sets throughout the weekend. 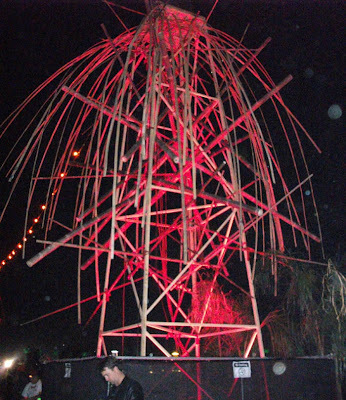 In the main stage area, there were a series of bamboo towers that surrounded the stage. At night the towers spewed out giant flames making for a really exciting visual display. At night the bamboo towers were light up with different colored lights. The band had lights surrounding the entire area, so the fans got a 360 degree visual display. The bamboo looked especially cool when lit up at night. Check out the pictures below. The Empire Polo Club is a pretty tropical setting, with well maintained palm trees throughout the venue. The bamboo structures were a good complement to the rich green setting. We’re not sure who provided the bamboo for the event, but they did a good job putting up the displays. 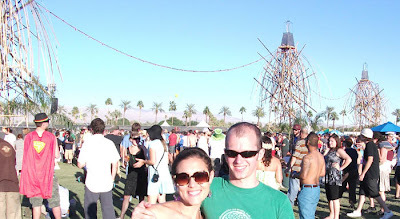 Above is picture of us with a couple of structures in the background. We’re looking forward to the next big Phish event and hope to see more bamboo at similar shows in the meantime. Have you ever heard of Bamboo Baseball Bats? Believe it or not, Bamboo Bats are actually a much better choice than traditional Maple or Oak. Maple bats are strong, but have a tendency to shatter, often endangering fans and players. They shatter because they are made from a solid piece of material. The most common bamboo bats on the market today are hybrids that containt both bamboo and maple components. As you can see form the picture, the bamboo pieces are compressed to create a strong solid core for the bat. A bamboo core provides more strength than Maple or Oak, with comparable balance. Bamboo, on the other hand, is made by compressing multiple pieces of material under extreme heat and pressure. This method makes it close to impossible for the bat to shatter. Also, players have reported the bamboo bats to have “excellent balance”. Bamboo baseball bats are of high enough quality to be used in Major League Baseball, but the league has yet to start using them. Aside for the obvious benefits, bamboo is a sustainable eco-friendly material. I have not had the opportunity to use a bamboo bat myself, but would love to her comments from those who have. Read more about Bamboo Baseball Bats. I would like to share an interesting piece of Artwork that incorporates Bamboo. This is actually a dried gourd with bamboo rings attached to the outside. 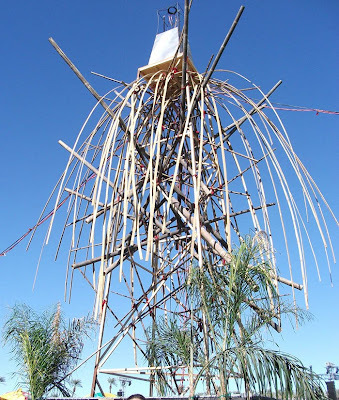 The artist used completely organic materials to make a very unique piece of art. 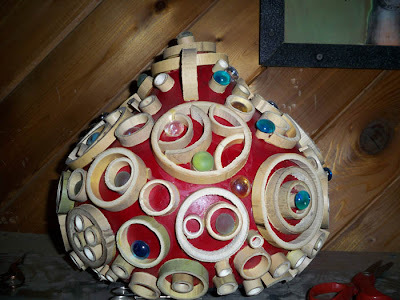 I always love to see unique bamboo art, so if you have any ideas or suggestions please leave a comment. 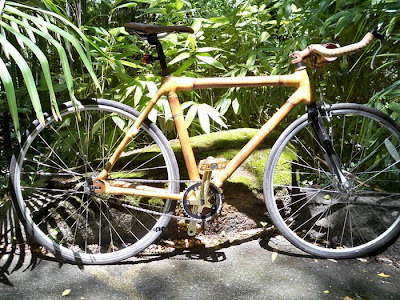 Masuelli Bamboo Bicycles are manufactured here in California, and are truly a piece of art. The bike frames are extremely strong and can withstand a great deal of punishment. The amazing natural prosperities of bamboo provide these bikes with both strength and a smooth ride. Not to mention, bamboo is an eco-friendly product, and Masuelli Bamboo Bikes rely on 100% California Grown Bamboo. 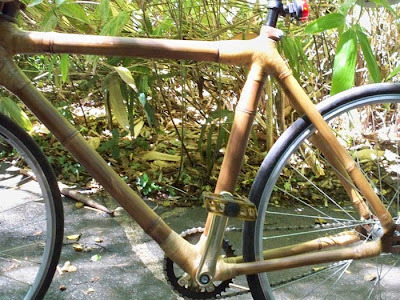 Bamboo bikes have been used throughout the world for many years and are starting to become more popular in the United States. If you are interested in testing or buying a Bamboo Bike, contact Jungle Supply Co.
Q: How do I Identify the Bamboo Growing in my Garden? Bamboo is a notoriously difficult plant to identify. Most species of bamboo have similar characteristics, with only subtle differences distinguishing the various species. Certain bamboo types are easily distinguishable, such as Black Bamboo or Leopard Bamboo. These varieties have striking color features that make them easy to identify. Often times, the best way to indentify is to take the plant to an expert. Our friends at Jungle Supply Company in California are happy to identify bamboo for you. Just email them a picture and they will help you in the identification process.